Today I discovered the most amazing household tip that I must share! Please bear with me on the gross topic...it will totally be worth your while! So, a certain someone in my household who will remain nameless clogged our toilet Thursday evening. I don't want to give away his identity, but I will note that his name is not Christopher, Truman, or Sly. In fairness, it has been running strangely for a couple of weeks now, and I actually suspect the problem is because while caulking the tub, I wiped my fingers off every so often on paper towels that I later flushed. So there, it probably was my fault, but he's the one who dealt the final clog, and I'm not taking any blame. Anyhoo, plunging did not work. Overflowing ensued. It was ugly. The next day, I bought industrial-strength professional toilet unclogging chemicals containing sulfuric acid, guaranteed to dissolve any organic matter. All manufacturer's instructions were followed TWICE, but again, overflowing and ruined towels ensued. Today, I made a trip to Keith's, my neighborhood funky hardware store, and bought myself a plumber's snake. I stepped up to the offending piece of plumbing, thinking out loud in my best Dolph Lundgren voice, "I must break you." Well, I forgot that in the end of that movie, Dolph got his perfect booty kicked to the curb, and so did I. Round 3 to the toilet. At this point, I'm a desperate man. I have a crush on my plumber, but he charges $75 an hour, and at the moment I can't even pay attention, so calling him isn't an option since he won't charge me in smooches. I logged onto E-How, and did a search on toilet clogs. Their advice wasn't anything other than what I had already been doing, however, the users of the site had posted 41 additional hints, virtually all of which were singing the praises of adding two tablespoons of dishwashing detergent to your toilet, waiting a few minutes, then plunging. Yes, I realize how incredibly stupid that sounds, and it is not for nothing that my middle name is Thomas because I am one doubtful boy. But again, I was more desperate than Charlie Sheen in a whorehouse, so I gave it a try. IT TOTALLY WORKED!!! Ten minutes after giving three good squirts of dish soap, I plunged hard for about 30 seconds and the whole thing miraculously drained. And it is working better than it has worked since we bought the house! 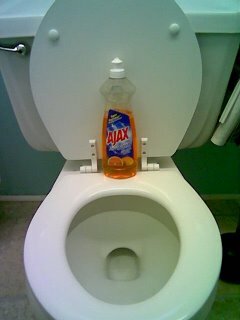 I'm telling y'all, start keeping a bottle of dishsoap in your bathroom...you're going to thank me for this someday. On another note, what does it say about me that I am this excited over plumbing? I used to get this excited over boys, clubbing, new cha-cha heels, etc. Does this mean I'm a grown-up? 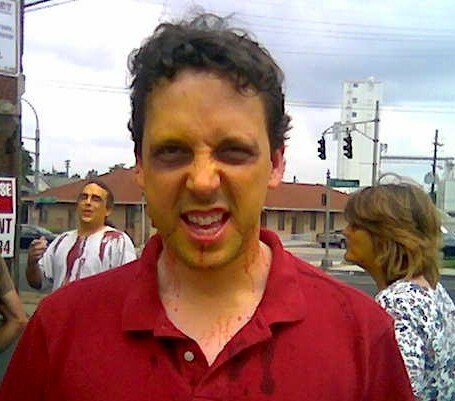 Really, as the clog cleared, Craiggers came home from filming as a featured zombie in a local movie. He was giddy because he may have gotten some close-ups eating the intestines of a victim, but I have to tell you, I was way more excited about the clog. I can't imagine digested intestines will be particularly good for my plumbing either. Christopher, thank you for the household tip. I'm going to have to remember this one--we're dealing with potty clogs around here all the time. Of course, I'm usually not told about it until the the yucky water is 1/4 inch from the top of the bowl! Holy crap. LOL!!! You go Christopher. LOL!!! You are something else. Hey, our painting is dry so to the P.O. next week. Congratulations! Both on your toilet and becoming a grown up. Though becoming a grown up is not much fun. Lowe's has become my favorite place to shop in the whole wide world. I feel so energized when I switch out faucets or I caulk something. Instead of paper towels, get an old towel which is very damp - usually works good for caulk laden fingers. Right now I'm on a mission to find a storm door. I'm insane, I tell you!!! HAHA. I'm sorry but I just got around to reading this! You know how I LOVE a good poop story! By the way, I have another hint from Heloise to share with you: WD-40 will get crayon off a wall in case you ever need to know that.